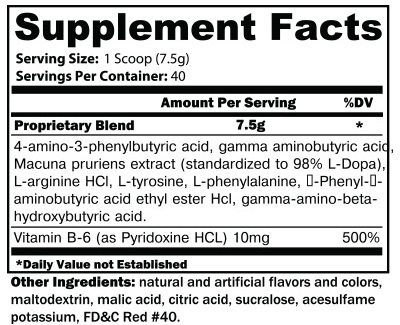 Noxitropin PM By CTD Sports, Fruit Punch, 40 Servings at SameDaySupplements.com® for lowest price. What Is CTD Sports Noxitropin PM? Noxitropin is designed to support a deeper REM sleep while increasing growth hormone, IGF-1, lean muscle and fat loss. How Does CTD Sports Noxitropin PM Work? Noxitropin contains active ingredients to induce a deeper, restful sleep, and promote GH Release. What's In CTD Sports Noxitropin PM? How Do I Take CTD Sports Noxitropin PM? To assess tolerance begin by taking one (1) scoop of Noxitropin PM 30 minutes prior to bedtime. After tolerance is assessed, take one (1) to two (2) scoops of Noxitropin PM with water 30 minutes prior to bedtime. Consult your health care provider before consuming this product. Do not use if you are pregnant or breastfeeding. Not intended for use by persons under the age of 18. After 12 weeks of use, discontinue for at least 4 weeks. Until tolerance is assessed, do not drive or operate machinery after consuming Noxitropin PM. We have a large selection of in-stock CTD Labs products including Sleep Aid items and others for the lowest prices at SameDaySupplements.com® It's always easy to shop for Noxitropin PM By CTD Sports, Fruit Punch, 40 Servings at SameDaySupplements.com because you can browse by reviews, brand, prices or search for specific ingredients using our search tool. In-stock orders placed before 3pm EST ship out the same day to USA, Brazil, United Kingdom, Canada, Germany, Australia, Japan, India, France and worldwide at the cheapest prices online.